12/4/2013–Statesville, NC– The Iredell Composite Squadron is proud to announce three new recipients of the Amelia Earhart Award. Cadets Robert Abruzzino, Zachary Fleming, and Jake DiMartinis were recently promoted to the rank of Cadet Captain. Cadet Robert Abruzzino joined the Civil Air Patrol in September 2011. He has been very active at the NC-162. He is currently the cadet Leadership Officer. He is a graduate of the Honor Guard Academy, Hawk Mountain, NESA, Blue Beret, RCLS, and currently is a GTM 1 and Ranger 2nd Class. Abruzzino was a Flight Commander for summer encampment 2013 and is looking forward to being Squadron Commander for this year’s winter encampment. Abruzzino is a high school sophomore and would like to attend West Point after graduation. 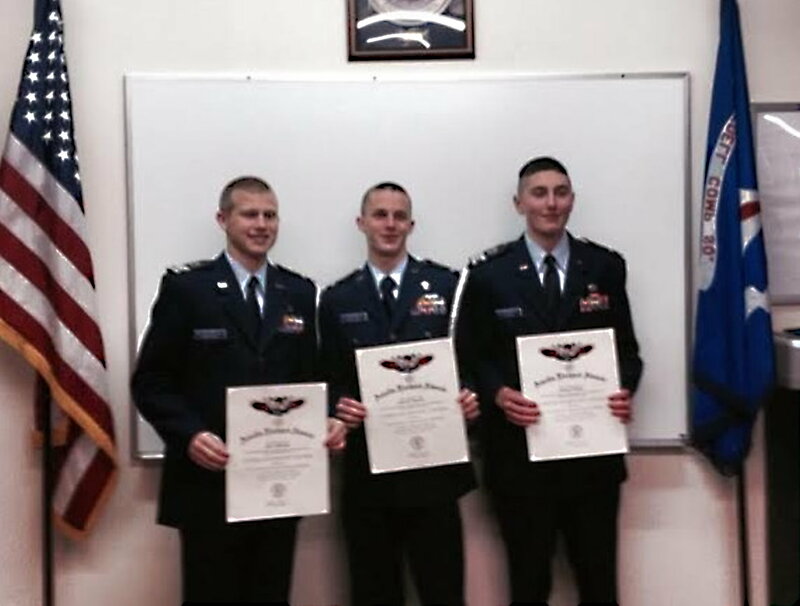 Cadet Zachary Fleming joined the Civil Air Patrol in August 2011. He has held numerous leadership positions at the squadron and is currently serving as the cadet Aerospace Education Officer. Fleming staffed the summer encampment 2013, working in public affairs. He is a graduate of RCLS, GTM 3, and Ranger 3 qualified. Fleming is a high school sophomore and would like to become an Air Force Officer. Jake DiMartinis joined the Civil Air Patrol in April 2011. He recently transferred to the NC-162 from the Massachusetts Wing. He is currently serving as Flight Commander at the NC-162. DiMartinis was the 2012 recipient of the VFW NCO of the year. He was the Flight Commander for the 2013 Massachusetts summer encampment, which received the title of Honor Flight. He was the Commander for his color guard team which placed second at the Massachusetts Wing color guard competition. DiMartinis is GTM 2 and Ranger 2nd Class . He is a high school honor student that is active in band, varsity cross country and wrestling. He hopes to attend West Point after high school graduation.